Not to be confused with Charles the Bold. He was born on 13 June 823 in Frankfurt, when his elder brothers were already adults and had been assigned their own regna, or subkingdoms, by their father. The attempts made by Louis the Pious to assign Charles a subkingdom, first Alemannia and then the country between the Meuse and the Pyrenees (in 832, after the rising of Pepin I of Aquitaine) were unsuccessful. The numerous reconciliations with the rebellious Lothair and Pepin, as well as their brother Louis the German, King of Bavaria, made Charles's share in Aquitaine and Italy only temporary, but his father did not give up and made Charles the heir of the entire land which was once Gaul. 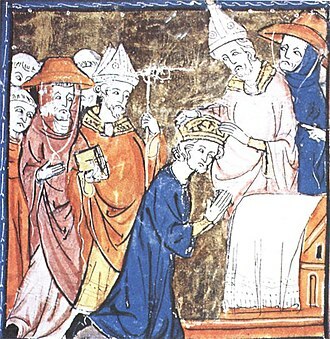 At a diet in Aachen in 837, Louis the Pious bade the nobles do homage to Charles as his heir. Pepin of Aquitaine died in 838, whereupon Charles at last received that kingdom, which angered Pepin's heirs and the Aquitainian nobles. The first years of Charles's reign, up to the death of Lothair I in 855, were comparatively peaceful. During these years the three brothers continued the system of "confraternal government", meeting repeatedly with one another, at Koblenz (848), at Meerssen (851), and at Attigny (854). In 858, Louis the German, invited by disaffected nobles eager to oust Charles, invaded the West Frankish kingdom. Charles was so unpopular that he was unable to summon an army, and he fled to Burgundy. He was saved only by the support of the bishops, who refused to crown Louis the German king, and by the fidelity of the Welfs, who were related to his mother, Judith. In 860, he in his turn tried to seize the kingdom of his nephew, Charles of Provence, but was repulsed. 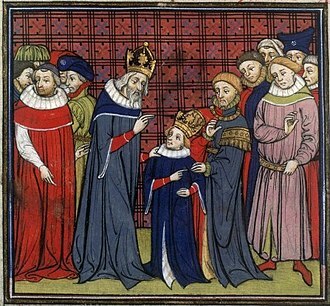 On the death of his nephew Lothair II in 869, Charles tried to seize Lothair's dominions by having himself consecrated as King of Lotharingia at Metz, but he was compelled to open negotiations when Louis found support among Lothair's former vassals. 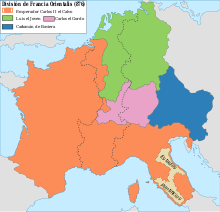 Lotharingia was partitioned between Charles and Louis in the resulting treaty (870). Besides these family disputes, Charles had to struggle against repeated rebellions in Aquitaine and against the Bretons. Led by their chiefs Nomenoë and Erispoë, who defeated the king at the Battle of Ballon (845) and the Battle of Jengland (851), the Bretons were successful in obtaining a de facto independence. Charles also fought against the Vikings, who devastated the country of the north, the valleys of the Seine and Loire, and even up to the borders of Aquitaine. 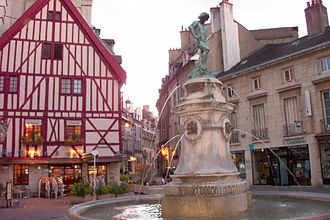 At the Vikings' successful siege and sack of Paris in 845 and several times thereafter Charles was forced to purchase their retreat at a heavy price. Charles led various expeditions against the invaders and, by the Edict of Pistres of 864, made the army more mobile by providing for a cavalry element, the predecessor of the French chivalry so famous during the next 600 years. By the same edict, he ordered fortified bridges to be put up at all rivers to block the Viking incursions. Two of these bridges at Paris saved the city during its siege of 885–886. 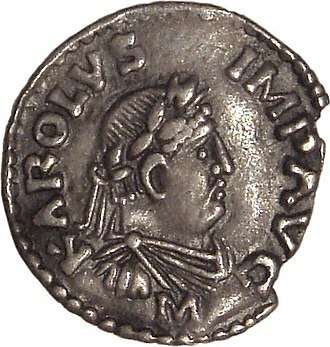 In 875, after the death of the Emperor Louis II (son of his half-brother Lothair), Charles the Bald, supported by Pope John VIII, traveled to Italy, receiving the royal crown at Pavia and the imperial insignia in Rome on 29 December. 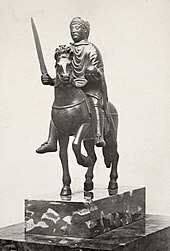 Louis the German, also a candidate for the succession of Louis II, revenged himself by invading and devastating Charles' dominions, and Charles had to return hastily to West Francia. After the death of Louis the German (28 August 876), Charles in his turn attempted to seize Louis's kingdom, but was decisively beaten at the Battle of Andernach on 8 October 876. It has been suggested that Charles' nickname was used ironically and not descriptively; i.e. that he was not in fact bald, but rather that he was extremely hairy. An alternative or additional interpretation is based on Charles' initial lack of a regnum. "Bald" would in this case be a tongue-in-cheek reference to his landlessness, at an age where his brothers already had been sub-kings for some years. Contemporary depictions of his person, e.g., in his Bible of 845, on his seal [[:|of 847]] (as king) as well as on his seal of 875 (as emperor) show him with a full head of hair, as does the equestrian statuette (c. 870) thought to depict him. The Genealogy of Frankish Kings, a text from Fontanelle dating from possibly as early as 869, and a text without a trace of irony, names him as Karolus Calvus ("Charles the Bald"). Certainly, by the end of the 10th century, Richier of Reims and Adhemar of Chabannes refer to him in all seriousness as "Charles the Bald". ^ Riche 1983, p. 150. ^ a b Riche 1983, p. 157. ^ Riche 1983, p. 158. ^ Bradbury 2007, p. 14. ^ Nelson 1992, p. 17-18. ^ Riche 1983, p. 204. ^ Nelson 1992, p. 13. ^ Riche 1983, p. 237. Dutton, Paul E. (2008). Charlemagne's Mustache. Palgrave Macmillan. Lebe, Reinhard (2003). War Karl der Kahle wirklich kahl? Historische Beinamen und was dahintersteckt. Dt. Taschenbuch-Verlag. Nelson, Janet (1992). Charles the Bald. Essex. Riche, Pierre (1983). The Carolingians:The Family who forged Europe. University of Pennsylvania Press. Wikimedia Commons has media related to Charles the Bald. Judith of Flanders was queen consort of Wessex and countess consort of Flanders. She was the eldest daughter of the West Frankish King and Holy Roman Emperor Charles the Bald, through her marriages to two Kings of Wessex, Æthelwulf and Æthelbald, she was twice a queen. Her first two marriages were childless, but through her marriage to Baldwin, she became the first Countess of Flanders. One of her sons by Baldwin married Ælfthryth, a daughter of Æthelbalds brother and she was an ancestor of Matilda of Flanders, the consort of William the Conqueror, and thus of monarchs of England. In 855 King Æthelwulf of Wessex made a pilgrimage to Rome, in July Æthelwulf became engaged to Charless daughter, who was no more than fourteen, while Æthelwulf was about fifty years old. On 1 October 856 they were married at Verberie in northern France, the marriage was a diplomatic alliance, both men were suffering from Viking attacks, and for Æthelwulf the union had the advantage of associating him with Carolingian prestige. In addition, the wedding was considered an event by contemporaries. Carolingian princesses rarely married and were sent to nunneries. Judith was crowned queen and anointed by Hincmar, Archbishop of Rheims, in Wessex it was not customary for wives to be queens. Although empresses had been anointed before, this is the first definitely known anointing of a Carolingian queen. In addition, West Saxon custom was that the wife of a king of Wessex could not be called queen or sit on the throne with her husband—she was merely the kings wife. The marriage provoked a rebellion by Æthelwulfs eldest surviving son, Æthelbald, however and son negotiated a compromise under which Æthelwulf received the eastern districts of the kingdom and Æthelbald the western. It is not known whether this meant that Æthelwulf took Kent and Æthelbald Wessex, Judith had no children by Æthelwulf, who died on 13 January 858. He was succeeded by Æthelbald, who married Judith, his step-mother, Judith was still childless when Æthelbald died in 860 after a reign of two-and-a-half years. The three year Carolingian Civil War culminated in the decisive Battle of Fontenoy-en-Puisaye, called the Battle of Fontenoy, fought at Fontenoy, near Auxerre, on the 25 June 841. The war was the contention over the territorial inheritances —the division of the lands of Charlemagnes Carolingian Empire between his grandsons, the three surviving sons of Louis the Pious. Despite provisions by Louis the Pious, war broke out between his sons and nephews and it was a defeat for the allied forces of Lothair I of Italy and Pepin II of Aquitaine and a victory for Charles the Bald and Louis the German. While hostilities continued until two years into 843, the Treaty of Verdun ending the war shaped and influences history in Europe even to this late modern date. 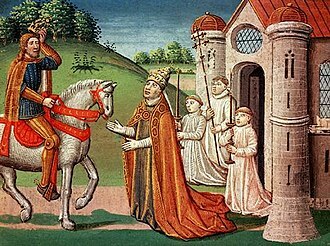 Louis the Pious throughout his reign had entreated to divide his empire meritoriously amongst his sons—all his sons—as it was required by the Salic Law of the Franks. 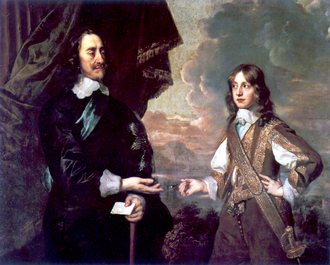 With the late-born Charles, his attempts led to civil wars which culminated in his defeat of his last rebellious son, Louis. Louis was left with Bavaria while Pepin, his grandson, was out of the inheritance. On 24 July 840 in Strasbourg, Lothair precipitated a new war by declaring his imperium over all the lands of the empire and, joining with his nephew Pepin. 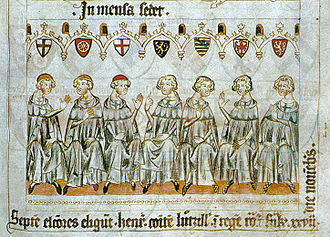 The barons of Burgundy divided over allegiance to Charles and Lothair, ermenaud III of Auxerre, Arnoul of Sens, and Audri of Autun pledged themselves for Lothair, while Guerin of Provence and Aubert of Avallon remained with Charles. Girard II, Count of Paris, Lothairs brother-in-law, joined Lothair also, in March 841, the Burgundians faithful to Charles accompanied Guerin to join him and in May, Louis of Bavaria and his troops met Charles army at Châlons-sur-Marne. In June, Pepin finally joined with Lothair in Auxerre, the two armies, of about 3,000 men each, met on 25 June. According to tradition, Charles established his camp at Thury, on the hill of Roichat and Pepin initiated battle and took the upper hand until the arrival of Guerin and his army of Provençals. 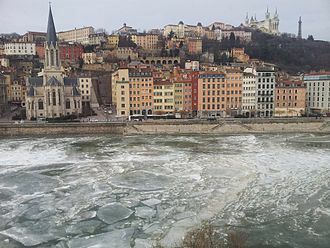 The Saône in Lyon by night. The battle as depicted in the fourteenth-century Grandes Chroniques de France. Obelisk commemorating the Battle of Fontenoy. The Spanish March and surrounding regions. A 17th-century depiction of Judith from the Flandria Illustrata.